Techknitting is posting an interesting series on stranding, and as part of it, mentioned the use of Strickfingerhuts (knitting yarn guides/knitting thimbles), linking back to my original post on the subject. For those who are unfamiliar with them, they are those gizmos that sit on the end of the left hand index finger, that are used by Continental style knitters (pickers) to hold and separate two or more yarns while doing stranded colorwork. Adding some more detail on the subject, I’d like to address a problem TK points out as being common among those who hold two yarns in one hand while stranding – differential feed. 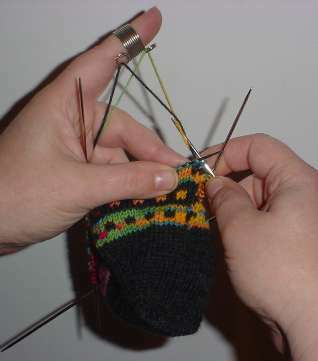 If a row has more or less equal numbers of stitches of both colors, both yarn strands are consumed at the same rate. But if a row has lots of Color A, but very little Color B, A will be eaten at a much greater rate, eventually causing the knitter to readjust his or her grasp of the yarn to even things out. Those of us who do use Strickfingerhuts find that the differential feed rate problem is greatly minimized compared to trying to hold both yarns in the left hand unassisted. Yes, eventually the difference in yarn consumption catches up with us and we have to yank the strands even, but no where near as often. We do however find that over time we prefer to put the dominant color (the color most represented on a row) in either the left or right eyelet to minimize the feed problem. There’s no hard and fast rule to this, it’s a matter of personal preference. Although I usually work stranding in the round, occasionally I have to do it in the flat. If I’m knitting stockinette in the flat using a Strickfingerhut, and I’m on the purl side, I prefer to have the dominant color in the left hand eyelet. For the record, I notice no difference in the appearance of the finished product if I mix eyelets – sometimes putting the dominant color in one, and sometimes in the other. I do however note that some other Strickfingerhut users do, and advocate always keeping the background color in the same eyelet regardless of its relative dominance on any one row. Again, experimentation is your friend.